If you look around you, it seems as though every day there’s an extraordinary story in the media that makes you marvel at the intuition and compassion of animals. 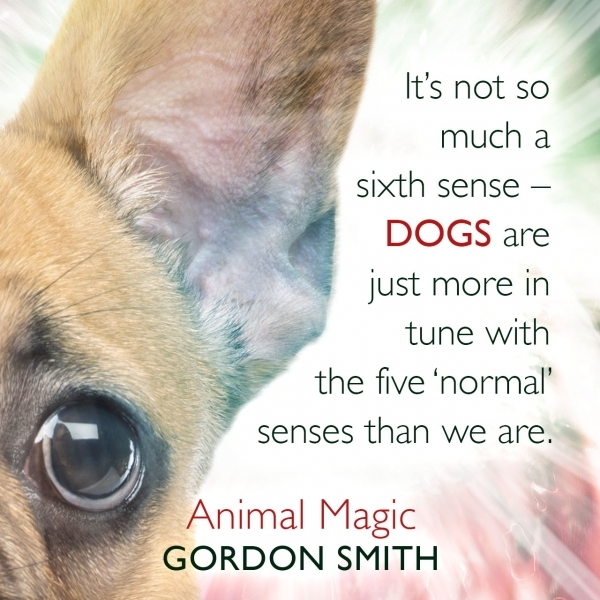 In my new book Animal Magic I’d like to tell you some of the stories I’ve come across in my many years of working as a medium and to answer some of the questions people ask about animals. These are in fact very similar to the questions I’m asked about humans. Do animals live on in spirit? Can they send us signs through a medium or do something else to make us aware of their presence, like moving a favourite toy or brushing past us? Will they be there to greet us when we pass? I can’t make a connection with everyone’s pet, but I try to reassure these people that of course the answer to all these questions is a resounding ‘Yes!’ Just like humans, animals cannot die for the life of them. They too go to the spirit world. I’ve lost count of the number of readings I’ve given where an animal has been there, sitting alongside a person who’s recently passed, a companion in death as in life. For me as a medium, the experience of bringing through an animal is just the same as making a connection to a human spirit: I feel a presence, a personality that is impressed on me, I see images and I feel a real, palpable emotional connection that affects the owners too. Just as I know if a human spirit is happy, I can tell when a dog or cat is content and wants to let its owners know that they shouldn’t worry about it. The spirit world is actually a different level of consciousness, a level that’s more illuminated, where a being can see further and more clearly than they did on Earth. So animals who are there can still be aware of what’s going on in our lives and offer support, just as they do in this world. 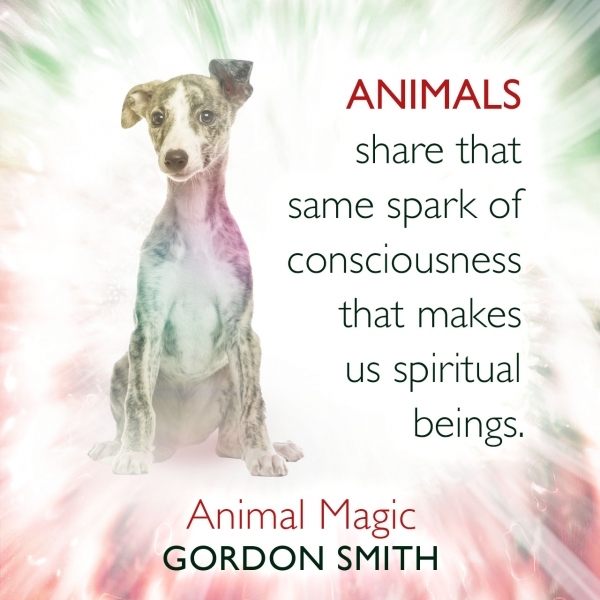 I have experienced the magic of animals in my own life. In particular I’ve known and loved many wonderful dogs. My beautiful Miss Meg, for example, a lovely springer spaniel, could find anything she was asked to with her keen nose. Even after she passed away in January 2016, she found something for me from her vantage point in the spirit world. It was two months after losing Meg that I was walking in the open countryside where I live with Cookie, my other springer, and suddenly lost my footing and fell over. The ground was frozen, but fortunately I didn’t hurt myself. After dusting myself off, I carried on walking for a bit and then, when I put my hand in my coat pocket, I noticed that I’d lost my house keys, which had a fob attached for the electric gate. I called out to Cookie, who was way ahead of me, to come back, and started to retrace my steps in order to find the keys, which I assumed would be lying near where I’d fallen. It was easy for me to identify the spot, as some of the long grass was flattened, but I couldn’t see the keys anywhere. After searching for 10 minutes or so, I gave up, as the cold weather was really starting to bite, but marked the spot so that I could try again the following day. I walked the same way every day and I knew that no one else used the route, so I was confident that I would find the keys. The annoying thing was that I only had two fobs for the gates, one of which was now lost, and that type of fob was no longer made, so if I couldn’t recover it, I’d have to spend a lot of money and change the whole mechanism. Every day I searched at the spot where I’d fallen. I pulled the grass and reeds in every direction, but found nothing. Soon I was considering changing the electric gates, fearing that if my only other fob went on the blink it would cause me a lot of trouble. It must have been a month later that one of my sons suggested letting Cookie sniff the remaining fob and setting him off on a mission to find the other one. But this added up to nothing, for Cookie was hopeless as a sniffer dog. Whatever he was asked to find, he just chased pheasants and grouse around the moors. As a last-ditch effort, I turned to my friend Robbie, who was walking with me that morning, and said, ‘Okay, we’re going to have to ask Miss Meg to find the keys for us.’ We both laughed and walked on over the rough terrain and up to the top of a nearby hill, which was actually where we had scattered our beloved Meg’s ashes. As we approached this beautiful site, we both suddenly noticed that hanging on a long reed were my keys. They were nowhere near where I’d fallen – in fact they were about a quarter of a mile further up the rugged hillside – and we had no idea how they could have got there. If a person had found them, they might have left them on a fence post, but not a thin reed. Also, no one else had come that way, as there wasn’t a path other than the thin line where our own footsteps had made a slight dent in the reeds and long grass.